The forest-based sector is a major feature in the bioeconomy landscape of Europe and the critical role of Europe’s forests in climate change mitigation, conservation of biological diversity and provision of forest goods and services continues to be part of the political agenda. So, it is vital that decision makers in Europe have access to up-to-date information about the state and performance of these forests. 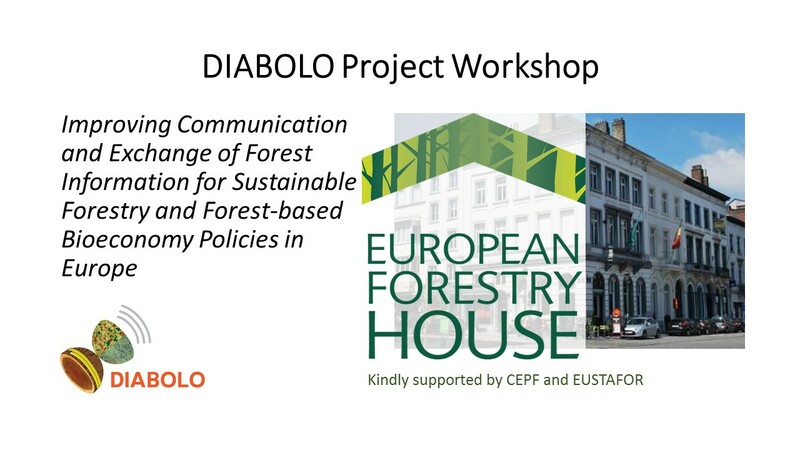 The DIABOLO project organised a series of European dialogue workshops on 13-15 February, 2018 at the European Forestry House, Brussels. Three days of workshops get underway with an introduction to DIABOLO from project manager Markus Lier of Luke. 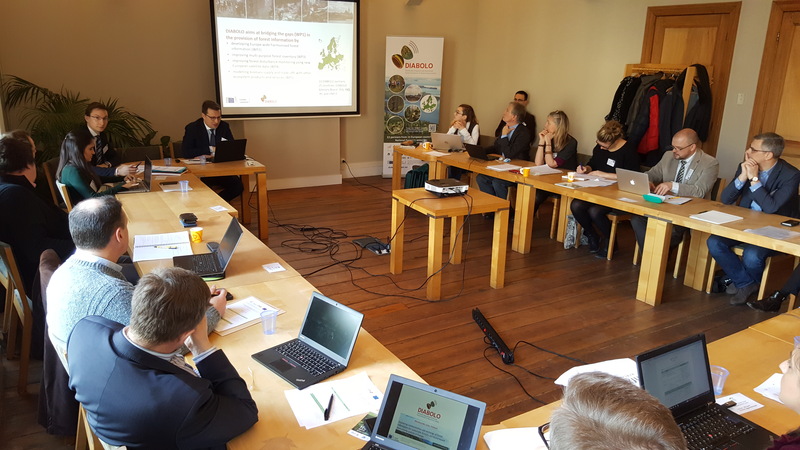 These were timely workshops, aimed at discussing the challenges facing the European forestry sector in relation to the demand, provision and exchange of information for sustainable forestry and forest-related policies. Stretching over three days, the Brussels-based workshops sought to improve knowledge communication and exchange of forest information at the science-policy interface in Europe. Each day focused on a particular topic: Day 1 – sustainable forestry, Day 2 -Natura 2000 & biodiversity and Day 3 – LULUCF & climate change. The workshops hosted over 40 invited participants from the forest information provider and end-user community in Europe, including representatives from national authorities managing forests and other forest related sectors (biodiversity, bioeconomy, climate), the European Commission services and European intergovernmental bodies; national forest inventory experts; EU and national associations of public forest companies and private forest owners; environmental, non-governmental organisations; research and academia. The outcomes are expected to contribute to relevant key actions of the new EU Forest Strategy, to ongoing discussions for a Forest Information System for Europe (FISE), and other European forest relevant monitoring and reporting processes (e.g., FOREST EUROPE SFM reporting, Natura 2000 monitoring, EU climate and bioenergy targets and LULUCF accounting). The workshops were organized by the University of Freiburg (ALU-FR), the Austrian Research Centre for Forests (BFW) and the Swedish University of Agricultural Sciences (SLU). The workshop was kindly supported by the Confederation of European Forest Owners (CEPF) and the European State Forest Association (EUSTAFOR).